Home Phone Applications Service Travel TRIPKADA launches at FlipTrip’s 6th Travel Meetup! TRIPKADA launches at FlipTrip’s 6th Travel Meetup! 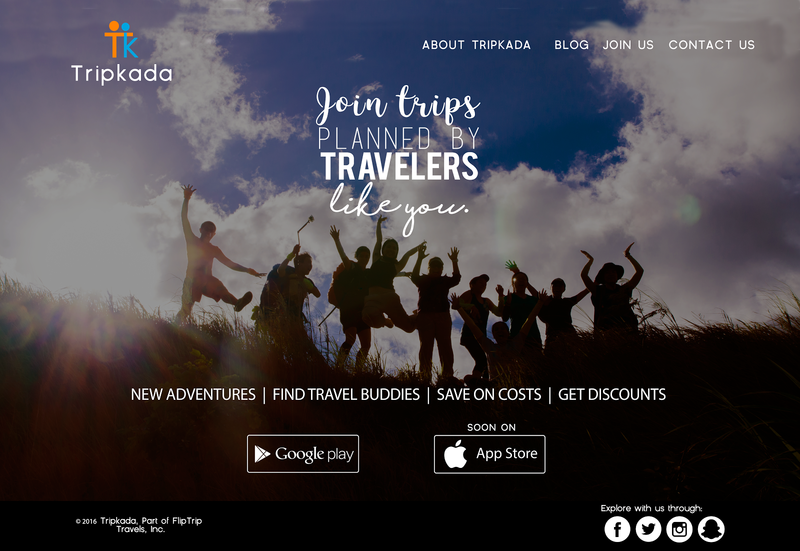 Tripkada = Your Trip Barkada ready to go out, explore, and have exciting adventures! Travel enthusiasts flocked to Poblacion, Makati on August 10, 2016 for the sixth edition of FlipTrip’s Travel Meetup. But unlike every other meetup, this time, FlipTrip had something special in store for its guests. That Wednesday night, FlipTrip launched its new mobile app, Tripkada, a platform where travellers can join group trips organised by fellow travellers. No need to wait for your friends to match with your schedules, budgets, and interests. No need to panic when flakers become one too many. Whether you’re a solo traveler, or a small group of friends, go on your next adventure and fill up your bucket list in a fun and affordable way with Tripkada. Simply log into the app, scroll through the available trips, and pick what you want to do for your weekend. Reserving your slot has never been easier! There is a convenient downpayment system that allows you to pay PHP500-1500 before the trip, and let’s you settle the rest at the meetup point when you depart with your newfound group of travel buddies! You can download the Tripkada App on the Google Play today! Fret not, iPhone users, the iOS version will come out on the app store in a few months. Trips are organised by fellow travellers who apply via their website, http://www.tripkada.com/ and are curated by Tripkada, to help ensure that everyone has a great experience. Indeed, it was a night full of excitement, as guests learned more about what new possibilities there are in travel and exploring the Philippines. FlipTrip CEO, April Cuenca, talked to the crowd, admitting that it was still a new concept, with the app still on Beta Release. She asks for the community of travellers to help them work to make it better, by letting her and the Tripkada team know if they encounter any problems or if they have any ideas to make it even better. After that, guests got to compete for travel gear perfect for their upcoming trips with Tripkada. Lifeproof phones cases flew off the table quickly, together with hiking shoes from Hi-Tec PH, and outdoor wear from Columbia Sportswear, Mountain Hardwear, and prAna! People fought over Vivo Lumio Your To-Go Kits, a definite must-have, with not just sanitisers, but also odour absorbers, and insect repellants in the kits. Gift Certificates were also up for grabs from Bitspace, The Circle Hostel, Ganso Shabuway, and Z Hostel. Paymaya cards and Latchpads were also everywhere! Who could forget the free beer served up by Miller Genuine Draft, and the food from Boteco Brasil sponsored by PLDT SME Nation? Guests proudly flashed their beer and dishes on their instagram accounts using #TripkadaLaunch! Everyone had a blast coming together as a travel community, and welcoming the launch of FlipTrip’s new app, Tripkada. It is truly inspiring to find so many people excited and eager to explore the Philippines together!